A view of the first nativity scene set Brownsville resident Emma Rios collected at her home. BROWNSVILLE — Anybody who knows Emma Rios knows what to get her for Christmas: another nativity scene for her collection. The hard part is finding one she doesn’t already have. 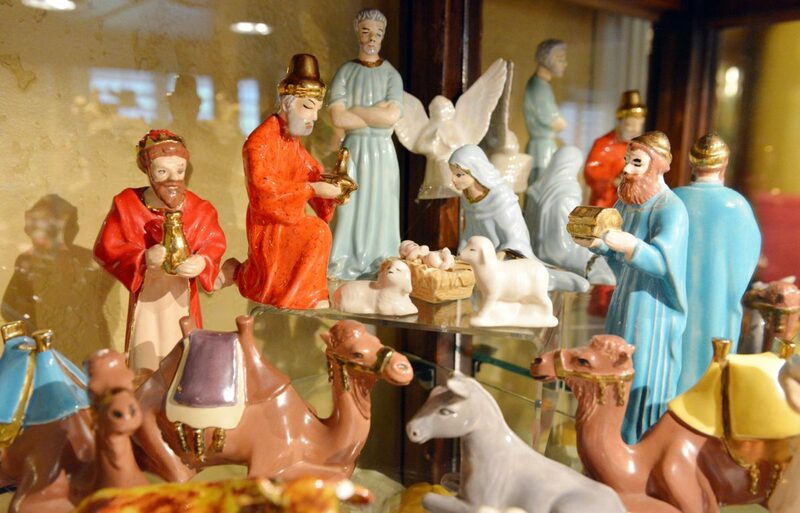 Rios is an avid collector of miniature Christmas nativities, with nearly 500 of them so far and no two alike. Some are gifts from friends and family, others Rios has discovered herself, while her husband, Ruben, is always on the lookout for potential additions to the collection. The sets come from around the United States, Europe, Central and South America, and elsewhere around the world. A number of examples are the work of native peoples. One recent acquisition from Oaxaca, Mexico, features exquisite beadwork and indigenous symbolism. Another indigenous example from North America shows Baby Jesus, Mary, Joseph and the rest nestled in the cupped hands of a creator deity. “As it turns out, doing DNA analysis, I found out that I’m 39 percent Native American,” Rios said. 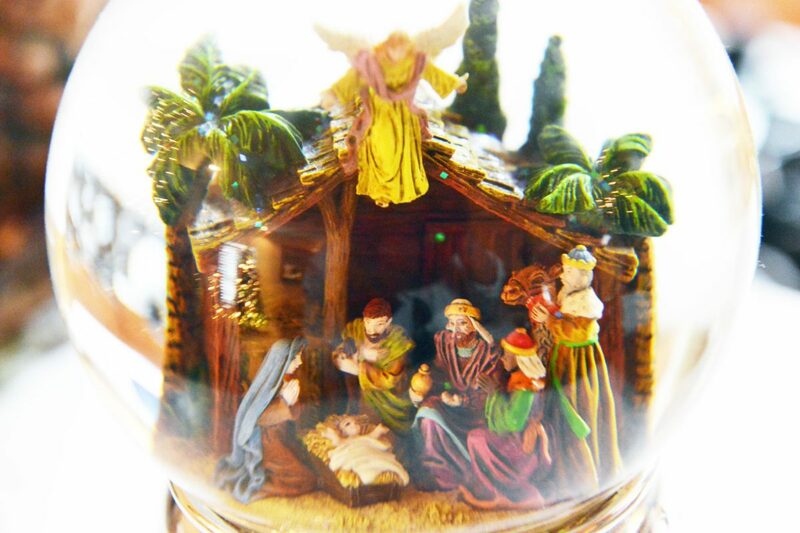 A snow globe nativity scene is just one of hundreds of nativity scenes on display at the home of Emma Rios in Brownsville. A view of a nativity scene at the home of Emma Rios in Brownsville. The Brownsville native taught at Skinner Elementary School until retiring in 2004. She then worked for the University of Texas at Brownsville for 10 years and now works part time for Texas A&M Kingsville, supervising student teachers. Rios bought her first nativity in 1971. It was crafted by an elderly resident of the Brownsville Housing Authority high rise downtown. It’s still on display in Rios’ home for Christmas, though a donkey is missing an ear and a cow is minus a horn. She received another set from a friend, then another from her husband. Things began to snowball, and around 1985 Rios realized she had developed a serious habit. Friends would bring her nativities from their travels abroad. When the internet came along, Rios started searching online as well. A friend told her about Amazon, though she hasn’t tried it yet. 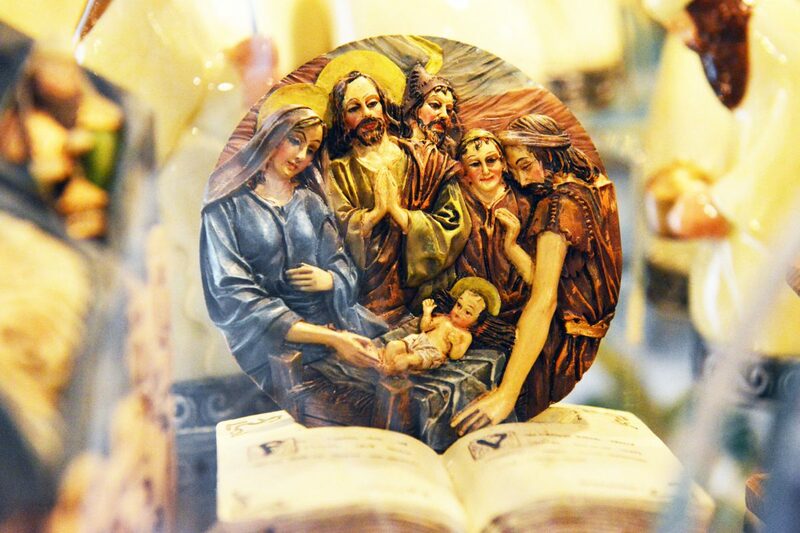 Each nativity has a story, Rios noted, pointing to a ceramic set in the nearest display case. Inspired by the gift, Rios decided to paint her own nativity ceramic — this one in the shape of a wreath, currently on display in the Rios kitchen on a wooden stand. Another of her favorites she refers to as “Pudgy Mary.” It came from Matamoros, Rios said. Rios’ nativities run the gamut from miniscule — pewter figurines occupying a red ring box the size of a walnut shell; the Holy Family carved into a wooden red pepper from New Mexico — to sprawling, such as an entire multi-level village, complete with palm trees and Roman ruins, surrounding the stable where the main action takes place. There’s a Peanuts motif with Woodstock, the legendary comic strip’s little yellow bird, in the manger in place of the Holy Child. Yet another nativity scene is fashioned from nails. A special display in honor of Rios’ love of baking features a nativity with figurines that look exactly like Christmas cookies, complete with icing. Also in that corner of the house is a Christmas tree adorned with dozens of symbols of Rios’ cooking prowess. Ruben, a retired law enforcement officer who spent 35 years with the Brownsville Police Department, also has his own corner, whimsical figurines reflecting his lengthy career, plus a tree festooned with Santa policemen, miniature handcuffs and the like. Every member of the family, in fact — sons, daughters-in-law and grandchildren — has their own tree with a personalized theme. With the trees, the hundreds of nativity scenes and other countless festive touches, Christmas is busting out all over at the Rios residence. And frankly, storage space is getting to be an issue. That’s why Rios is collecting smaller nativities these days — but still collecting, make no mistake. She’s acquired three new ones this year and is currently seeking something specific. She likes to get her nativities set out by early December so she can enjoy them as long as possible. It takes about one month to put everything out and another month to put it all away, Rios said.